Why are we seeing unprecedented rates of depressions? What’s behind our current opioid epidemic? And what can be done about it? Journalist and author Johann Hari suggests that everything we think we know about addiction and depression is wrong. Johann has written for The New York Times, The Los Angeles Times, and many other outlets. He was named ‘Newspaper Journalist of the Year’ by Amnesty International UK and his TED Talk, aptly titled “Everything You Think You Know About Addiction Is Wrong”, was viral hit, with over 25 million views. Pertinent to today’s discussion, Johann is the author of Chasing The Scream, which chronicles his 3-year investigation and research into the war on drugs and the nature of addiction. And his more recent book, Lost Connections is a compelling deep dive into the nature of depression, it’s underlying causes and unexpected solutions. As many of you know, addiction and mental health are subjects of great personal importance. Better understanding that nature of these conditions is the motivating force behind this conversation, which is is everything I hoped it would be. This is an incredibly powerful, educational — and at times controversial — exploration into what drives these malignancies, why they are so difficult to overcome, and how a new approach can plot a more hopeful and solution-based course forward. Many see Johann’s ideas as radical. And although I don’t entirely agree with everything Johann prescribes, there is great wisdom in much of his findings. If you suffer from addiction or depression, this is a must listen. If you don’t, chances are someone you care for does. This conversation can provide the insight and tools for better understanding the struggle — because mental health truly impacts everyone. 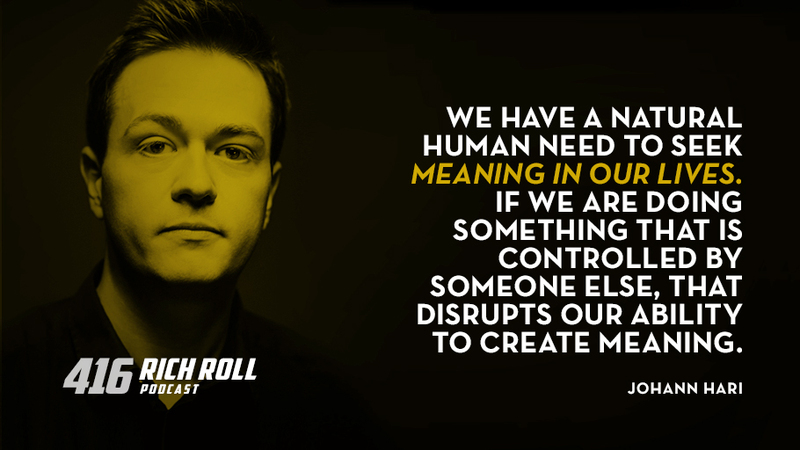 For the visually inclined, you can watch our entire conversation on YouTube at bit.ly/johannhari416 and the podcast is now available on Spotify. On Running: Born in the Swiss Alps, On Running shoes feature the first patented cushioning system which is activated only when you need it – during the landing. To learn more about On go to on-running.com/richroll. STRAVA: The social media platform for athletes. For a limited time, Strava is offering Rich Roll Podcast listeners a chance to try their Summit features for FREE. Go to www.strava.com/summit and enter the code RichRoll at checkout. The Guardian: Is everything you think you know about depression wrong?